Swansea's Sam Ricketts and Lee Trundle have been named in the Professional Footballers' Association League Two Team of the Year. The accolade caps a magnificent year for Ricketts who has gone from playing non-League football to making his full international debut for Wales. 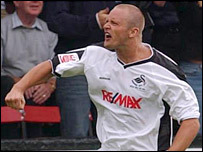 Trundle, who also made the Division Three last season, is Swansea's top scorer with 23 goals so far. Cardiff and Wrexham failed to have a player in their divisional sides.